Mackie HUI fits comfortably on the desk just at the right working height. Reinforced angled monitor bridge will hold near fields and any size computer monitor. Fully adjustable sliding computer keyboard and mouse shelf. 8 rack spaces for ProTools Audio Interfaces and related peripherals. Easily accessible shelves for either tower or desktop CPU. On heavy-duty casters for mobility and easy cabling. Sound and sight lines optimized for comfortable extended sessions. Categories: Music, Keyboards, Coda Series. The CODA is inspired by Mackie Design’s HUI Studio Console and Digidesign’s ProTools. 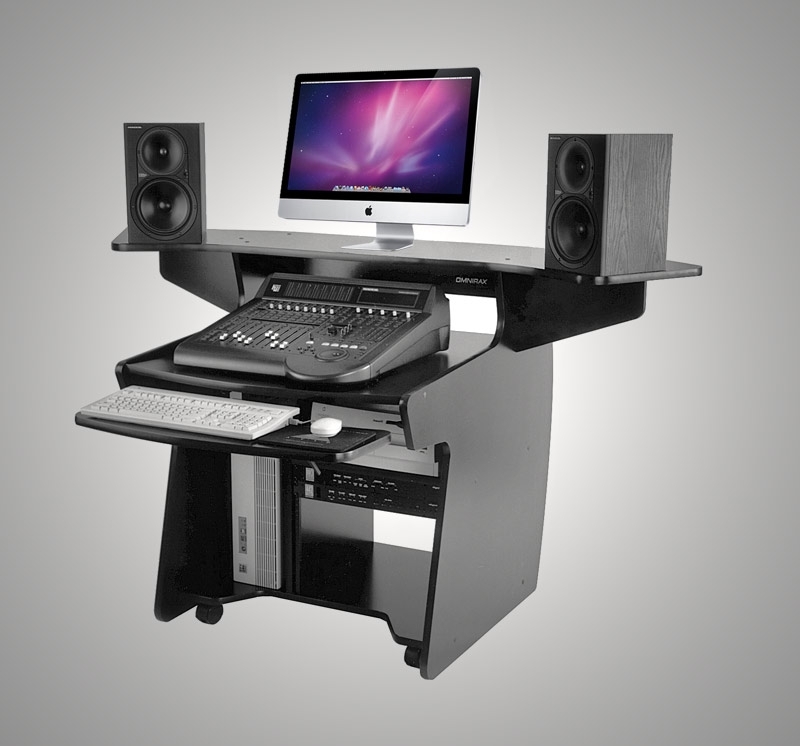 Its bold, innovative design provides a compact, ergonomic environment for digital mixing and editing. Desk Surface Height , 29.4"
Desk Space in front of Bridge , 21.25"
Nearfield Monitor Height , 38.75"
Clearance Below Bridge , 8.6"